Apple is trying to match the expectations of its fans but somewhere it is gong behind in ruling. At the most important event WWDC 2016 June we will get to see Apple latest software iOS 10. We have loads of expectation and will it be packed with all notorious features for our convenience. We want more easy operation and easy interface so it will not remain time taken for the users. It is well pretty early to mention anything about iOS 10 but we cannot stop ourselves for talking big about big things. Here is what we do like to experience in future with iOS 10. Siri is happening and it will become more happening with iOS 10. You can see Siri new avatar and it will be engaged in answering calls, transcribe voicemails and texts. Siri will be more efficient in future that it may be able to identify the voice and its reaction. This feature would turn out to be very much in demand if iOS 10 will include it. Apple 5 years ago have introduced us Apple IDs and as a member the users will pay for iTools and Mac services. There are various people not satisfied for accumulating Apple IDs more than one. So we can expect with iOS 10 with one digital ID which will not land us in more confusion. So, hope to see Apple ID’s into one with iPad air 3. 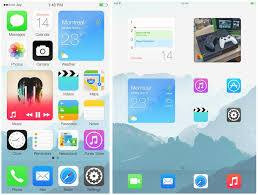 Apple may announce the support of third party app with the launch of iOS 10 as we literally feel helpless when we do not have opportunity to mail, calendar and safari services in better way. But with the invention of the iOS 10 you may have option to select a default third party app by replacing the standard iOS. The delete if pre-installed app cannot going to be feasible atleast till 2018. But we should fortunate enough to hide the pre-installed app with iOS 10 so we could manage to hide it from home screen. . So that secrecy and personalization would be maintained. More than one user for one device is appealing and without letting other know about your privacy. So, iOS 10 will allow users to create multiple accounts on a single device. So users will have privilege to log in with their pin, password and Touch ID fingerprint. But the phone so personal device so multi user support is good but only for the professional use as at the personal level people will not appreciate this feature. Note: This was a guest post by Rohan Mahndiratta!